We hold notions about worth very highly in our society. The standards of worth vary from situation to situation, within contexts, and between race, gender, class, and other constructs, but the idea of folks being deemed deserving, whether of something good or something bad, hold strong and fast, even if people are not always aware that they do. Recently, some friends and I went out to dinner, and in an age of food allergy awareness, I was surprised that this particular restaurant only offered two options for me to be able to eat out a very extensive four page menu of selections. I could have grilled chicken or grilled steak. Fortunately, I am not vegan, so I opted for the grilled chicken, but what if I had been? As I pondered this with my husband, we concluded that the restaurant might presume folks with dairy allergies would just go someplace else to eat, given that they don’t cater to that type of clientele. There’s certainly nothing wrong with that. Plenty of other restaurants do cater to folks with multiple food allergies, and now my friends and I know not to choose that particular restaurant for a future gathering. I can’t help but wonder, though, about whether or not folks with food allergies “deserve” to be able to have more than a choice of grilled chicken or grilled steak when going out to eat to a restaurant which comes highly recommended. Whether we think we do deserve it or not won’t change that particular restaurant’s menu for now, but it serves as yet another reminder to me that I firmly do believe all people deserve to be able to eat good food, regardless of food allergies and health restrictions. 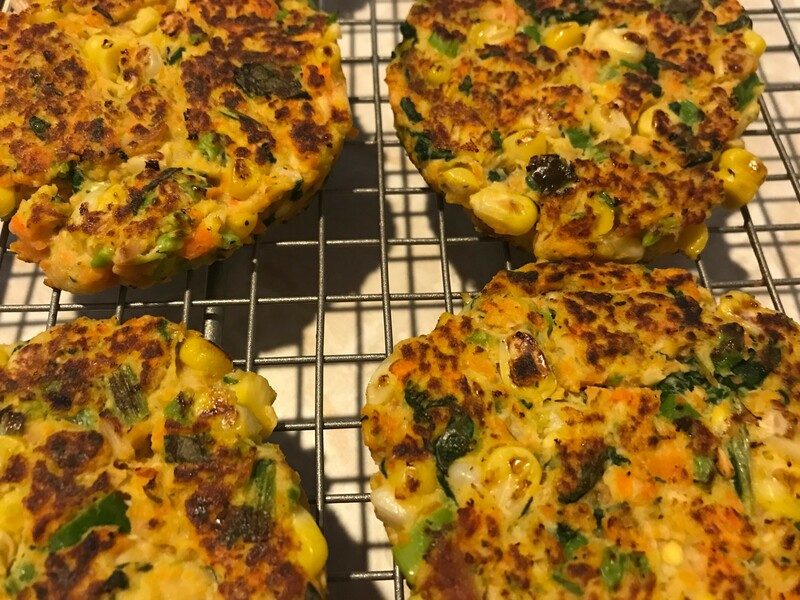 So, last week, when I decided to make chicken and corn fritters, my goal was to create something which was healthier than all the recipes I found. I had leftover corn and chicken which I wanted to use, and when I put the ingredients into “recipes”, out popped many recipes for chicken and corn fritters. The problem, though, was that they all called for deep or pan frying with a lot of oil, as well as a lot of white flour and many eggs. I wanted something which I could feel good about eating. So, I made several changes. First, I added kale to the chicken and corn, because I also had leftovers of that. Secondly, I opted to puree cooked carrots as the main binder which allowed me to reduced the flour substantially and use half as many eggs. I also chose oat flour for my flour to add protein and fiber, and used egg whites instead of whole eggs. Finally, instead of frying the fritters in oil, I used the Pompeian non-propellant olive oil only spray and cooked the fritters on a griddle. The result were delicious, healthier fritters which used up my leftovers and didn’t leave anyone with that heavy feeling you often get with fried foods. Mix the chopped chicken, kale and corn together. Puree the cooked carrots with the “milk” and add to the chicken-veggie mixture and blend well. Whisk the egg whites (or whole eggs or flaxseed mixture) and add to the fritter mix, stirring well. Add the oat flour, herbs, garlic and the peppers and stir until all is well incorporated. Preheat a griddle to 350 or a shallow pan over medium heat and spray with the Pompeian olive oil spray. Stir the fritter batter and scoop mixture by the 1/4 cup and drop onto the hot griddle. Using a spatula, spread the mixture into 1/2 inch think circles.